As the citizens of the United States prepare for the passing of the baton to another President, it might be worth it to pause and reflect on leadership and power. Many are having Second Thoughts about what to do to influence the passing of the baton to another incumbent. For that matter, our reflections turn to consider what is leadership? What is power? How can leaders positively influence the action of others? Is there a right way? Is there a wrong way? Does it differ at the worldwide level from that of the organizational and individual levels? These questions have tugged at my mind as I contemplated the sources of power and sought to identify individuals in organizations who exemplify these attributes. Selacuse in his book “Leading Leaders” discussed the category of powerful people whom he defined as the ‘elites’. Despite the natural negative connotation derived from this term, these are individuals who have “more” – more education, more talent, more money and more clout than ordinary people. Their knowledge, skills, money or power give elites (customarily leaders) special privileges. Moreso Selacuse defined leadership as the ability to cause other persons to act in desired ways for the benefit of the organization or group. He conveyed an interesting spin on contrasting leadership at the presidential level. A comparative analysis was done on the leadership style of President George H.W. Bush with the leadership of his son President George W. Bush. Father Bush strongly believed that if other nations were to join the coalition to drive Iraq from Kuwait, the United States had to take an active, energetic leadership role in convincing them to join the coalition. He believed that leadership required diplomacy across a broad front and exhibited this through direct contact with other world leaders. Moreover, he did this through diplomatic missions; through action at the United Nations and other international organizations; through foreign embassies in the United States; and through American ambassadors abroad – to build and maintain a coalition of nations united in their efforts to achieve the goal to drive Iraq from Kuwait. George H.W. Bush’s leadership was based on persuasion before action. In contrast to his leadership style, his son George W. Bush acted under the belief that other countries had no choice but to follow the United States. George W. Bush and his administration believed that leadership by the United States seemed to flow automatically from its status as the world’s only superpower. At the time, the administration made it publicly clear that if other countries did not follow the U.S. into the war against Iraq, they would go to war alone. That certainly deviated from the importance of creating a coalition. They believed that unilateral action by the U.S. would naturally lead to multilateral action by other countries. The “if you build it they will come” doctrine expressed the belief that the United States was a unique country not just in terms of its power but also its moral authority for using that power. To summarize this comparative analysis, Bush – the father, had broad experience in international diplomacy and long-standing relationships with world leaders at that time. He intimately knew and was on a first-name basis with national leaders and used this to his advantage to influence worldwide leaders. On the other hand, his son had no previous diplomatic experience and did not know the foreign leaders. Therefore, he often delegated important tasks to other members of his administration. Naturally then, he did not have the influence that his father did. In my opinion, this was indeed an interesting view on the issue of leadership and power at the global nation-wide level. Definitely something to consider as we step into the future of our country, organizations or at the individual level of leadership, power and success. You Micro Manager! Yes you. Repeat after me…I will not micromanage. I will not micromanage. I will not micromanage. 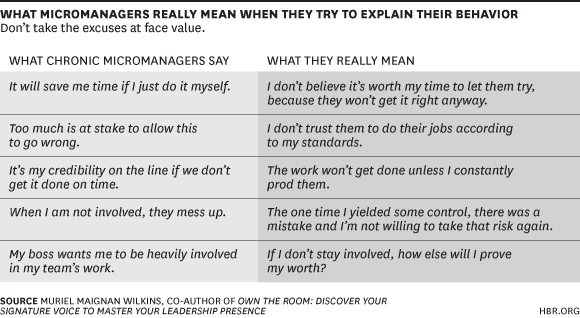 These are the best words of caution for new managers. I was asked the question why some managers feel it necessary to micro manage. Reflecting on that I decided to share through this post. Managers who micromanage makes coming to work a nightmare. Micro Management is the practice of managing with excessive control or attention to detail. It tells employees that there is a lack of trust. Essentially that the manager has little confidence in his/her team and their capabilities. Often it drives the team away and what is worse, it is the organization’s most talented people who frequently walk away. The company is then left with those workers who will simply show up for a ‘paycheck’. No commitment, no care. As a manager, this is certainly grounds for disaster. You will either drive your team crazy or stress yourself out with the inevitable burn out. Don’t be afraid to fail. At its very core is the feeling that if you don’t do things yourself, things are going to fail. Not so. This is a myth. Sometimes failure is good. It helps us learn and grow, and our teams may end up with the belief that you are ‘human’. They will work together with you to achieve the results. Essentially, you will win. Focus on the ‘what’ not the ‘how’. I am a firm believer in sharing the organization and your department’s goal with your team. Doing so stimulates their creativity and provides solutions that you may not have considered. -Look at your to-do list to see which task can be passed on or delegated to those reporting to you. -Engage your team. Let them know what level of detail you expect from them and where they need to connect with you. -Think Big. Focus on the big issues that you need to concentrate on and place your energy and attention on those. Be a proactive communicator. Copy supervisor on emails. Keep him/her up to date on your activities before being asked. Teach him/her how to delegate. Volunteer to help with tasks or projects and keep your manager abreast of the progress. Practicing these points will help you succeed. The converse is also true. 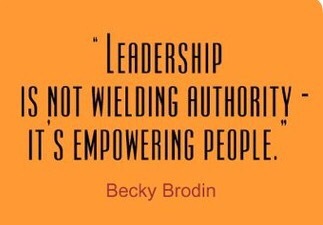 Continuing to micro manage is Ancient…a thing of the past where autocratic leadership was game. Doing this now is sure grounds for disaster. So it’s your choice. Choose wisely and experience success. Author Dr. Shelly CPosted on October 20, 2016 October 21, 2016 Categories LeadershipTags #entrepreneur, #everydayinspiration, career, discover, leader, Leadership, life, management, micromanagement, postaday, workplaceLeave a comment on Being Micro Managed?